Matteo Thun & Partners has signed the Masterplan for 6.400 m2 of the renowned Marina di Venezia Camping, located in front of Venice. 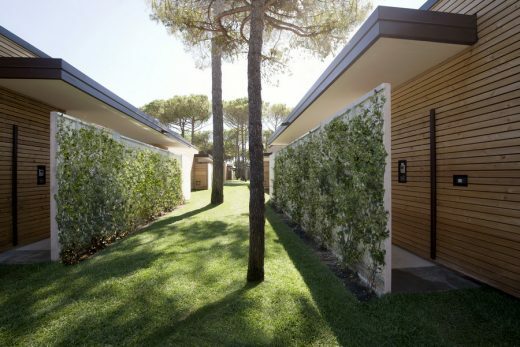 A group of 32 small patio houses, called “Garden Villas”, offer a contemporary interpretation of camping bungalows providing both comfort and a close contact with nature. 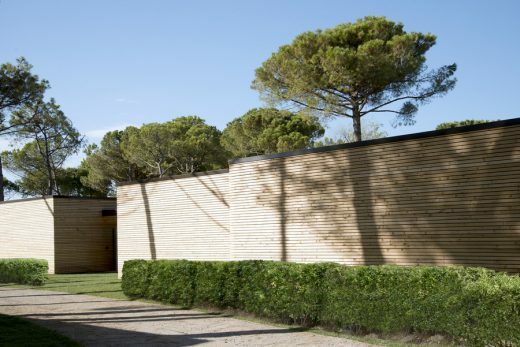 The project was guided by the Genius Loci: The presence considerable number pine trees and the wish to save as many of them as possible, has determined both the overall “botanical architecture” layout as well as the floor plan of the villas. 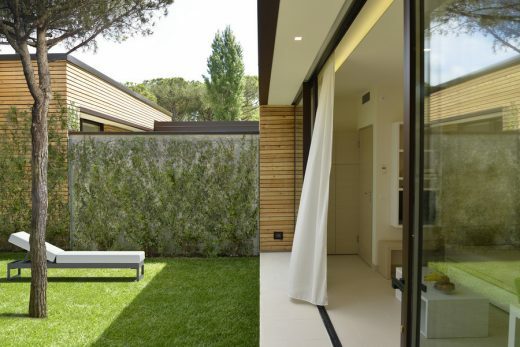 Two opposing volumes, a courtyard with a terrace, a lawn and the original pine trees compose each wooden Garden Villa. 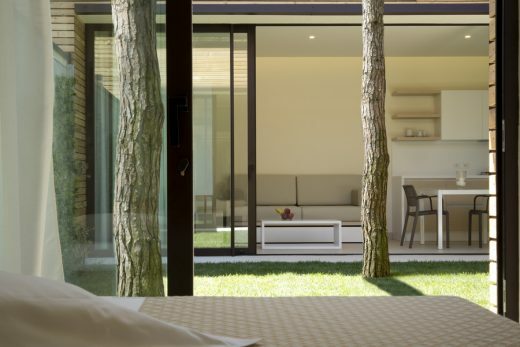 The green and the terrace, including a shower, become integrated parts of the living and offer a close and fresh contact to nature. Two bedrooms and a bathroom are situated on the one side of the garden. Vis-à-vis, the living area includes the dining and kitchen, a TV corner and a bathroom. The roof of the terrace provides shade on sunny days and protection in case of rain in order to perfectly connect the two areas. Thanks to the wide, doubleglazed window fronts, the interiors and exterior melt together. The natural stone floor used both in- and outdoors, highlights the fluidity between all areas. The building is made with wood-cement blocks, an environmentally friendly material, granting thermal and acoustic insulation. Thanks to the larch-wood cladding, that ages beautifully with wind and sun, the facades of the villas gain an individual character.